I love food magazines. I enjoy reading them all the time. Once in a while, you'll discover a recipe that's simple enough yet looks visually delicious. I was reading the valentine's section and discovered this gem of a recipe. The original recipe calls for Baileys but I decided to use Kahlua instead. I also don't have ground almonds so I just add in some corn flour for thickening. The initial recipe is enough for only 2 servings but I tweaked it to make 4 servings. Seriously sinful dessert. As you dig into the cake, you can see the rich lava like chocolate flowing out. YUM! 1) Heat oven to 230 degree celcius/210 degree celcius fan. 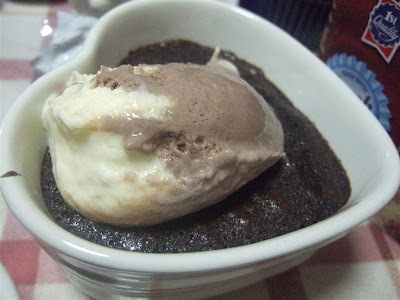 3) On a microwave bowl, melt butter and chocolate together in a microwave. Mix well. 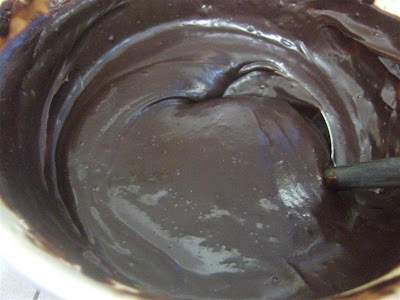 (You can do this the double boiler method if you wish. 4) Whisk the eggs and sugar until light and pale. 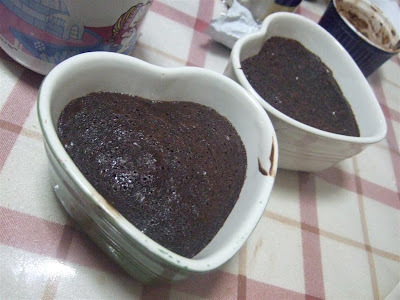 Fold the chocolate mixture into this and then mix the Kahlua and corn flour in. 5) Pour into the four buttered ramekins. You can bake them straight away or keep them in the fridge. 6) Bake for 10 minutes/ 12-13 minutes if taken out from fridge. 7) Dust with icing sugar before serve. Rise my precious! RISE I SAY! This recipe sure looks yummy.Would like to try when have time but then again I have a better idea -why don;t u bring them to our workplace when you make them again next week? Instead of kahlua or Bailey's, any suggestion for non-alcoholic subs? Looks yummy. 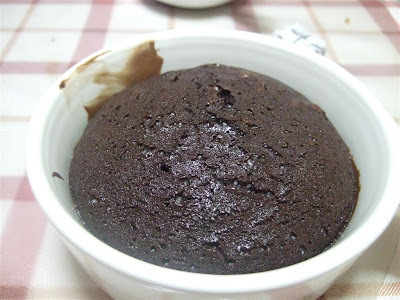 Bring some to our workplace when you make them next week, hehe ^_^. Any suggestion for non-alcoholic subs for kahlua or Bailey's? 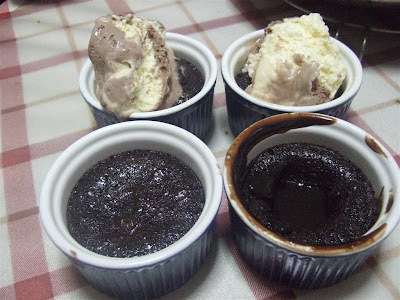 Bring to workplace ah... those molten cakes need to be consumed straight from the oven tu.. or else the centre wont be as liquidy smooth! thanks for the alcohol subs link Thanis! thanks dear, i love it alot, as well as my parents, will definitely try it out. GREATTTTTT.